SAN JOSE - The San Jose Barracuda (@SJBarracuda), American Hockey League (@TheAHL) affiliate of the NHL's San Jose Sharks (@SanJoseSharks), are proud to announce that captain John McCarthy, assistant coach Jimmy Bonneau and broadcaster Nick Nollenberger will be in Oakland this Friday, November 16 to participate in practice with both the Sharks Sled Hockey Team and the Special Hockey Team as a part of Barracuda community outreach and the Cuda Cares program. 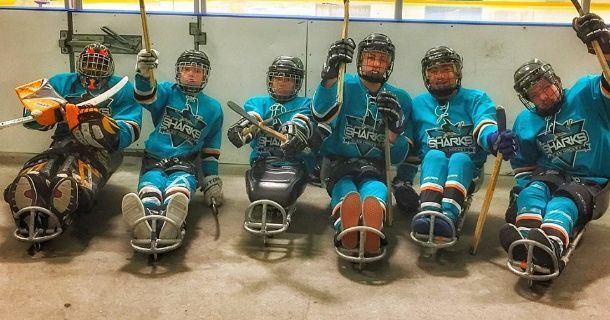 Both the Sharks Sled Hockey Team and Special Hockey Team practice once a week at Oakland Ice from 6-7 p.m. as they prep for the 2019 Toyota-USA Hockey Disabled Hockey Festival that will be held in Wesley Chapel, Florida from March 28 to April 7, 2019. Earlier this year the two teams participated in the same event in Chicago, IL. In 2017, the Sharks won the Sled Hockey C-division with only 5 skaters and a goalie in their first appearance at the festival. "Being able to participate in activities like this is one of the most rewarding parts of being a pro hockey player," said McCarthy. "These kids bring us far more joy than we could ever bring them. Their outlook on life, despite their disabilities, is truly inspirational." 2019 will mark the 15th Annual Toyota-USA Hockey Disabled Hockey Festival. According to USA Hockey's website, the mission of the Festival is to provide a fun and exciting weekend of hockey in a grand event as well as promote and grow disabled hockey throughout the country. The event is the largest disabled hockey event of its kind, bringing together all of the disabled hockey disciplines in one location. The Oakland Ice Center Operated By Sharks Ice is a state of the art ice arena with two ice surfaces (one NHL regulation and one Olympic sized), food service, a pro shop, ballet room, off ice party/meeting spaces and a variety of other amenities. The OIC was built in 1995, and is owned by the City of Oakland. In 2007, Sharks Ice LLC, a subsidiary of Sharks Sports & Entertainment, took over management of the OIC. Since that time, Sharks Ice has provided over 6000 local Oakland children each year with the opportunity for free and low cost access to skating and ice sports, including public skating, physical education classes, after school programs, hockey, figure skating, sled hockey, special hockey, and a host of other activities.